A parent would be proud to have one child follow in their footsteps. David and Delores Winans saw their many children and grandchildren have successful careers in gospel music, and use their music to become effective ambassadors for Christ. The vocal quartet The Winans and the brother sister duo BeBe and CeCe Winans are family’s most critically and commercially successful members. 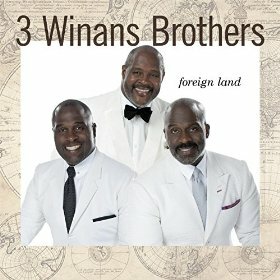 Foreign Land, the new recording by the 3 Winans Brothers, combines members from those two successful groups. 3 Winans Brothers consists of Marvin and Carvin Winans who earned six Grammys as members of The Winans, and Benjamin “BeBe” Winans, who won a total of six Grammys as a member of the duo BeBe & CeCe as well as a solo artist. For all of the diverse music made by all of the members of this legendary family in all of their iterations, their formula for success has been fairly consistent. The children and grandchildren of Mom & Pops (who died in 2009) Winans fuse a gospel message with R&B production techniques, and the family has historically employed that method to a high effect. Both The Winans and BeBe & CeCe Winans had a presence on R&B that was unheard of during their collective productive periods - which lasted from 1981 to the early 2000s. While outfits such as The Rance Allen Group, Andrae Crouch, the Clark Sisters received airplay on secular radio, The Winans and BeBe&CeCe took it to another level by crafting tunes played by club DJ’s. Both groups received plenty of criticism as a result of their crossover success. What I call the “Jesus count” – an inventory of the number of times Christ’s name is mentioned in a gospel song –may draw its origin to the rise of BeBe & CeCe back in the late 1980s and early 1990s. I always thought that the whole Jesus count criticism was unfair. The Winans family formula worked so well precisely because they deployed those danceable melodies, sweet vocals and doo-wop inspired harmonies for a purpose higher than enticing listeners to shake their booties down to the ground. Besides, listeners would have to be clueless to not know who The Winans are referring to on “Friend,” a track from their Teddy Riley produced 1990 album Return. “Move In Me” is a mid-tempo piece of stepper’s friendly funk that finds the distinctive vocals of Marvin Winans singing about how the move of the Holy Spirit can change situations. “I’m Not Ashamed” is a straight funk number driven by a bass line inspired by Stevie Wonder’s “Higher Ground” and features all three singers contributing their distinctive voices to their bold declarations that they will stand for Christ. The dreamy ballad “I Choose You” is the type of tune that drives the Jesus count folk crazy due to the fact that it is unabashedly ambiguous. BeBe and Carvin deploy their respective baritone and buttery tenor voices to singing an ode to the ladies in their lives or the Savior who first chose them. It doesn’t really become clear that “I Choose You” is about Christ until Marvin delivers a melodic sermon at tune’s end. The trio returns to that formula on another mid-tempo steppers cut, “Please Don’t Go.” Once again, the three vocalists alternate taking the lead on a verse with Carvin opening with his smooth as silk tenor, followed by BeBe’s operatic baritone and Marvin bringing it to a close with his passionate improvising. “I Miss You” is a beautiful tribute, most likely to Ronald Winans, the late member of the legendary quartet who died in 2005. The three brothers take turns expressing the pain of losing a loved one, describing the qualities that they miss while reminding listeners – and themselves – of the hope of seeing their loved one in the hereafter. Few artists can stake claim to being as responsible for the sound of modern gospel music as the Winans family. Starting in 1981 when The Winans dropped “The Question Is,” this first family of praise has been a mainstay on secular and gospel radio. And while Foreign Land stands as a statement of this trio’s desire to remain spiritually separate from the culture writ large, this project stands as a testament to Marvin, Carvin and BeBe’s enduring ability to sing the songs of Zion in a foreign land. Strongly Recommended.